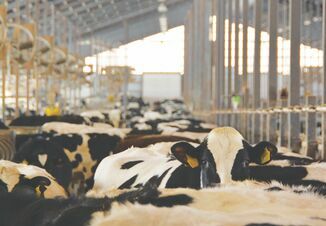 In the span of 48 hours, Mike and Linda Hanson’s cows went from being milked and hand fed in a mid-20th century tiestall barn to being robotically milked and fed in a 21st century, state-of-theart cross-vented freestall facility. Now, a year later, the 100- plus Ayrshires and Holsteins nonchalantly get milked by two robotic milkers and calmly go up to the feed bunk as a Lely Vector robotic PMR (partial-mix ration) mixer pushes up and delivers feed 10 to 11 times daily. The mixer delivers feed to a separate pen of dry cows and springing heifers two to three times each day as well. Also unique to the system: A “feed kitchen” where the system uses an overhead grabber to selectively collect baled haylage and corn silage and deliver it to the mixer. Additional grain, protein and minerals from separate bins and water can be added to the preformulated ration. “Right now, we’re tickled pink with the system,” says Mike Hanson, who farms with his wife, Linda, and sons, Matthew and Steven. The Hansons are milking just more than 100 cows and eventually plan to milk 120 cows in the five-row facility. They also have room for about 30 dry cows. All the mechanization in the new barn allows the Hansons to get their other farming done, which includes some 2,800 acres of wheat, malting barley, corn, soybeans and alfalfa near Goodridge, Minn., about an hour northeast of Grand Forks, N.D. Crop farming is the main business in the region. The Hanson farm is located on the bed of extinct Lake Agassiz, which inundated the Red River Valley of Minnesota and North Dakota, and much of Manitoba and western Ontario when the last glaciers melted 10,000 years ago. Mike, Linda and Matthew Hanson in the feed alley of their five-row, 150-cow crossvent barn. This shallow, flat valley supports millions of acres of cropland. With warming temperatures, corn and soybeans now compete with wheat and small grains for acreage. More competitive crop prices have meant much of the livestock (other than beef cattle) has left the area. That makes dairying in the region all the tougher, competing for labor and other resources. Now, checking on things, managing fresh cows, breeding and maybe fetching a few cows for the robotic milker takes just a couple of hours each morning. And that’s with twice the cow numbers, he says. While robotic milkers have been around for a couple of decades, robotic PMR mixers are new to the U.S., and Hanson’s feed kitchen is the first of its kind in the U.S. Another Minnesota farm, John Scherber’s dairy near Rogers, Minn., featured on the cover of this magazine, uses a robot mixer but fills forage from upright storage using silo unloaders. The Hansons opted for the system for labor savings, convenience and as a way to deal with the extreme winters in northwest Minnesota. Dead-of-winter temperatures can plunge to -30°F and not climb above 0°F for a week or more at a time. 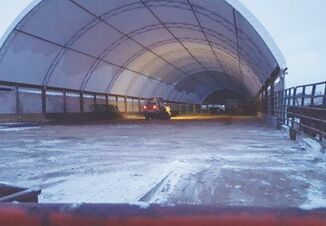 Having an enclosed, insulated facility, including the feeding system area, is a more comfortable, trouble-free way to deal with the harsh conditions. The feed grabber selects forages off the feed kitchen floor, which is laid out in a predetermined grid programmed into the robotic feeder software. The Hansons still must bring corn silage and haylage into the feed kitchen. But the area is large enough they can stockpile a week’s worth of feed in the facility and pick the warmer days in winter to replenish the supply. The heated floor of the feed kitchen is divided into grids marked by yellow lines. The grid is programmed into the system’s computer software, and the feed grabber simply goes to the prescribed quadrant on the floor to pick up corn silage or baled haylage. The grabber “knows” how much forage it is picking up by the amperage load on the grabber motor. The Hanson’s must still manually check forage moisture regularly to ensure the correct amount of forage dry matter is being mixed. But he and the Hansons are still on a learning curve, even after a year of use. “There’s room for improvement, but that will come,” he says. The first challenge was the change in feeding management. In the tiestall barn, Hansons were simply feeding hay and haylage free choice and topdressing a grain/protein mix twice a day. Now, they’re feeding a partially-mixed ration that also includes corn silage. Cows get 10 lb. to 12 lb. of pellets per day through the robotic milker, based on milk production. The high-energy pellets are an incentive for cows to come and get milked at least three times per day. The feed grabber delivers feed to the PMR Vector mixer. Motor amperage is used to calculate the amount of feed picked up in each grab. So the PMR fed at the bunkline is primarily forage. It’s essentially a 50/50 mix of alfalfa baleage and corn silage with some grain, protein and mineral added in to balance the overall ration. The ration also can’t provide too much energy because the cows won’t be motivated to go after pellets in the robotic milker. The other challenge is balancing the ration in the mixed Ayrshire/Holstein herd. The Hansons were milking 60 cows in the tiestall barn and with springing heifers were able to bring about 70 Ayrshires to the new facility. To help fill the barn, they purchased a friend’s mixed herd of a few Ayrshires. “There’s a big dry matter intake difference between the Holsteins and the Ayrshires,” Thorpe says. “Body capacity wise, there’s a dramatic difference between these two animals. “Typically, in other robotic herds, we push the PMR harder with Holsteins. But if we push too much energy into the ration, the Ayrshires here get full and we get too many fetch cows with them,” he says. Thorpe’s current dry matter intake target is about 48 lb. to 50 lb. for the Ayrshires. Knowing if they’re actually consuming that amount is a challenge because of the mixed herd. Plus, with up to 10 feed deliveries per day, the Hansons have never cleaned managers or measured weigh-backs. In fact, that’s one of the system’s selling points. Feed waste is near zero, claim Lely salespeople. 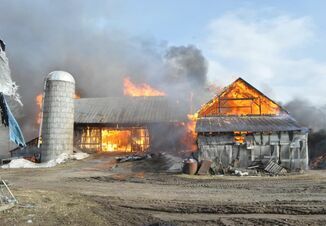 But Thorpe says cows will still sort feed. “This is a herd of professional feed sorters because of how they were fed before,” he says. “So we still get quite a bit of sorting and that gets pushed out to the end of the bunk. “Health wise, the cows are doing phenomenally well. But we would like to see a little more milk production,” he says. The Hansons are average 65 lb. per cow across the herd on 2.7 milkings per day, up 20% from the old facility. The Ayrshires average 4.1% butterfat, so on a fat-corrected basis, they produce about 70 lb. of 3.5% milk. Thorpe adds: “There is a big learning curve with a system like this, and it still is a work in progress.” However, he’s confident he and the Hansons will be able to take advantage of all the system can offer. And then the cows will, too. Note: This article appears in the October 2017 magazine issue of Dairy Herd Management. Can Calves Become Resistant to Antibiotics?